How do I get the .so files I need to run puppeteer, and how do I set my LD_LIBRARY_PATH to see them? When you run docker exec , it will try to launch your commands inside a running container. I am building an OpenMPI application using Docker and Kubernetes. I am having an issue with building the docker image. When I build the image on my local image repository, the file gets compiled and when I get into the container, the file "test" is there. However, when I am building the docker image in the minikube local repository the command line does not get executed and the "test" file is not there. I'm learning Kubernetes, and trying to setup a cluster that could handle a single Wordpress site with high traffic. From reading multiple examples online from both Google Cloud and Kubernetes.io - they all set the "accessMode" - "readWriteOnce" when creating the PVCs. My question is how do you handle persistent storage on a multiple-replica instance? I do not have access to sudo in this environment and have already been told that my goal should be to get the missing libraries (listed below) and bundle the libraries with my package that gets deployed, and point to them with LD_LIBRARY_PATH. I have already tried figuring out how to get any of these files, like libX11-6.so, for example, but haven't figured out how. I've tried doing apt-get download on them in an Ubuntu docker container, but that has given me .deb files. Do export LD_LIBRARY_PATH=app/lib/:$LD_LIBRARY_PATH && npm start instead of just npm start? Is this correct? If so, how can I gather these files, and is that how I am supposed to use LD_LIBRARY_PATH? I have an encrypted message as a string in python. 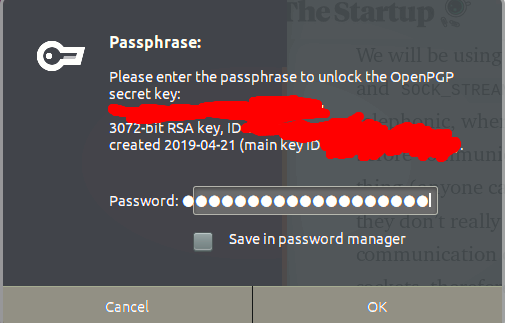 I want to decrypt it with a program called pgp. Then it prompts for private key. Is there a way to do all of this in python when the encrypted message is saved in a variable in python? I know you use the os module to make terminal commands to other programs. i am creating a 4G SDN (software defined network) based EPC (eveloved packet core) which consist of Service gateway (SGW), packet data unit gateway (PDN-GW), controller, sink, Radio Access network (RAN). lxc-start: controller: lxccontainer.c: wait_on_daemonized_start: 842 Received container state "STOPPING" instead of "RUNNING"